The comment I hear the most from people about my wedding photography is, "I feel like I was there." I love hearing that because I know I have captured the essence of a wedding through my photos. Raw emotion is what drives my photography. 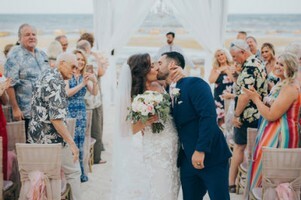 As a visual storyteller my goal is to capture the raw, spontaneous moments that make up a wedding day and to show your unique love story through photos. My goal is not just to make incredible photographs, but to make images that truly capture the relationship between two people in love. I love the whole flow of the wedding day, from the excitement of a bride getting her hair and makeup done with her closest friends and family, the moment that she puts on the dress and her dad sees her for the first time, the moment her nervous groom sees her walking down the aisle. That is my favorite moment of the day. I feel honored to document a couple's love story on the most important and intimate day of their lives. I offer packages with photography and some video. Using photos from the day, music, audio and video footage, I create a wedding trailer that tells the story of the day. Why do I include video? Photography freezes a moment in time that you want to remember for the rest of your life. Video brings you right back to that moment and allows you to relive those moments. Bringing in all the elements of photography, video, audio and music together, I create a complete emotional story.